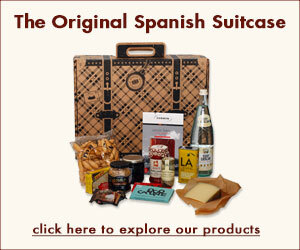 Since we at Spanish Suitcase headquarters regularly pilfer from our own inventory, we always have excellent Spanish staples in our kitchen cupboard. This recipe relies on one of our favorite pantry finds — Conservas María Jesús Traditional Tomato Sauce in Olive Oil. Since discovering this hearty tomato sauce, we’ve stalled experimenting with our own. An excellent base for Spanish and Italian recipes, this sauce is delicious with pasta, served as a compliment to albóndigas and spread over rustic bread. The combination of the tomato sauce with crispy green beans and buttery shavings of Campo Montalban makes for a simple and sabroso end to the week. In a large cazuela or saute pan, heat 2 tbsp of olive oil over medium heat. Right as the oil begins to smoke, add in the green beans. Stir continuously over medium heat until beans begin to brown, approximately 6-8 minutes. 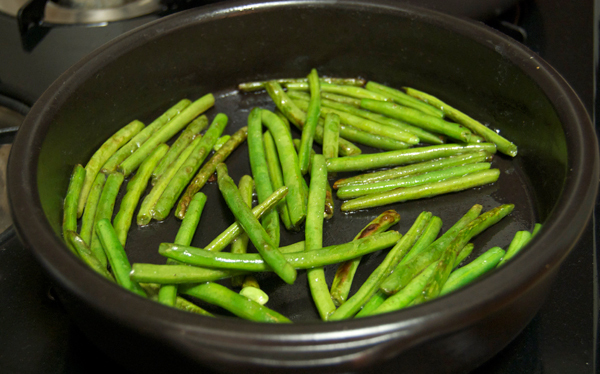 Once the skin of the green beans begins to crisp, lower heat and toss in an additional 2 tbsp of olive oil. Partially cover the pan and let beans cook for 20 minutes. Finished beans should be crisped on the outside while still retaining their structural integrity and color. Before removing beans from pan, toss them with the garlic and a pinch of salt, to taste. Remove beans and let cool slightly. Chop into small slivers, exposing the inner seeds. While the green beans are cooking, prepare the pasta and tomato sauce. Over high heat, bring a large pot of salted water to a rolling boil. Add pasta, cooking to taste and reserving 1/2 cup of the cooking water. Drain and rinse pasta. Add pasta and reserved cooking water back into large pot. Decant tomato sauce into a small saucepan. Setting over low heat, bring sauce to a simmer. Sauce will be warmed through after five minutes. To assemble dish, add half of the heated tomato sauce into the large pot containing the pasta. Mix sauce into pasta until all noodles are thoroughly coated. While plating pasta, spoon some of the remaining tomato sauce over the noodles. 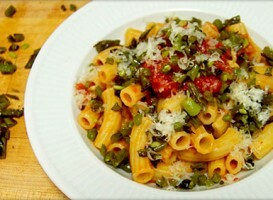 Following the tomato sauce, sprinkle the crisped green beans — including seeds– over the noodles. Finish off each plate with grated Campo Montalban or a similar firm, pressed cheese. This recipe relies on one of our favorite Spanish pantry finds — Tomato Sauce in Olive Oil from Conservas María Jesús artisans in Navarra.